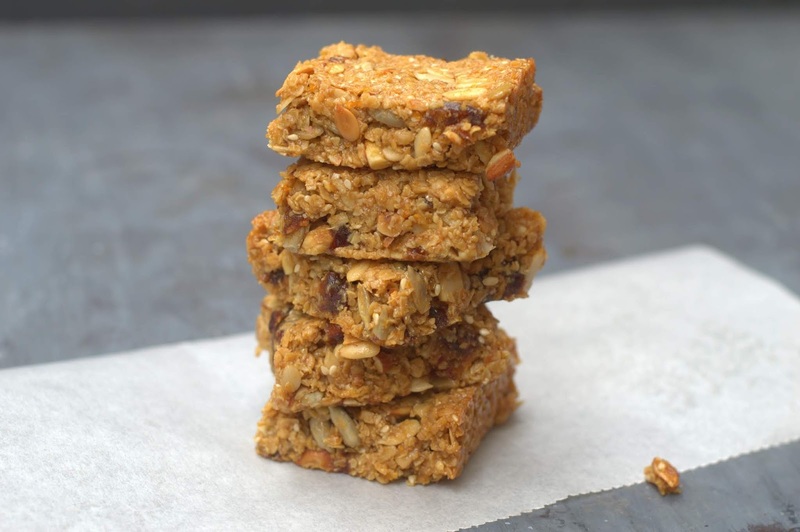 We may disagree on what these should be called, but am sure we all nod in agreement when I say - nothing really beats homemade stuff, especially when it comes to granola, granola bars etc. They put the store bought stuff to shame , are super easy to make and you can customize them to your taste.Try these today if you haven't baked your own yet. I am sure you will wonder why you did not make these earlier,I promise you will never buy these again! 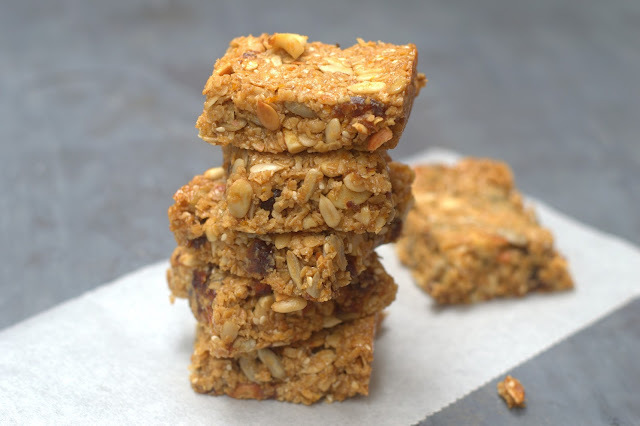 We love Granola Bars, Double Chocolate Granola, these 3 Ingredient Orange Flapjacks and this Peanut Butter Granola. But who can resist trying out new recipes? I recently tried these Date Bars from Yotam Ottolenghi, choc-a-bloc with seeds and nuts with that Mediterranean touch you find in his recipes. I know you don't mess around with recipes like these, but I reduced the sugar and butter to suit our preference. They are still quite indulgent and gift-worthy, so keep these in mind during Christmas and Diwali. You can change it to your taste, have fun with it! Here is what I did. Watch me make these simple bars.Please do not forget to subscribe to my channel for new videos - baking basics, tips and simple recipes for beginners. Freshly squeezed orange juice - 2 teaspoons. Pre heat oven to 170C. Line an 8'' square tin with baking parchment,leaving an overhang. In a large bowl, whisk together the oats, the processed oats, salt cinnamon. Add in the nuts and seeds, mix well to combine. Toss in the dates, separate them if they clump up. In a large saucepan, heat together the butter,date syrup and sugar. We just need t to melt and combine well, no need to boil or heat too much. Grate the zest of the orange and stir in the orange juice,mix well. Dump in the oats and nuts mixture. Mix with a spatula,making sure all the ingredients are well moistened. The mixture will be crumbly. Press it firmly into the tin. If you do not press firmly the bars will be crumbly. Bake for 15-20 minutes or until the top turns a light golden brown. Check at 15 minutes, be very careful to not over-bake or the bars will burn. They will be soft when you remove them from the oven, will firm up as they cool. Let the bars cool in the tin over a cooling rack. Cut them into squares when they are still soft. Once the bars cool completely, separate the bars and store airtight. Looking for something even simpler? 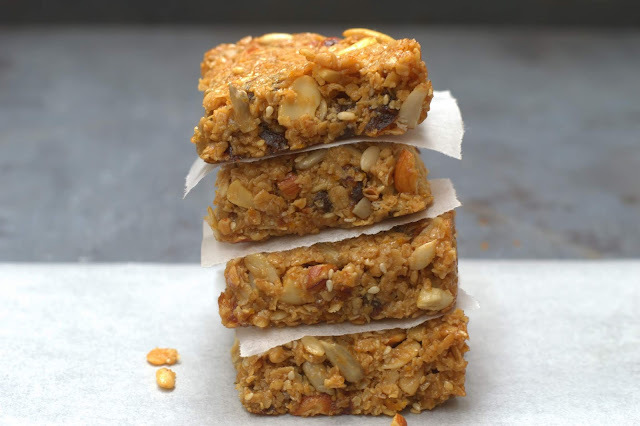 Try these 3 ingredient Orange & Chocolate Flapjacks!